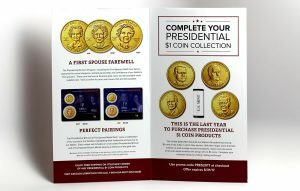 This is the last year to buy Presidential $1 Coins and related products, the United States Mint announced in a brochure that was snail-mailed to customers this month. 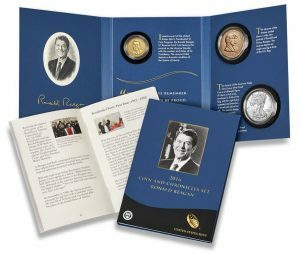 In preparing for the Oct. 11 launch of the 2016 Ronald Reagan Coin & Chronicles Set, the United States Mint updated its online product page. Today, Aug. 18, the United States Mint began selling its limited-edition coin cover with two circulating-quality dollars commemorating Ronald Reagan, the 40th President of the United States. Today, Aug. 9, the United States Mint started taking orders for sets of circulating quality dollars featuring former Presidents Ronald Reagan, Gerald R. Ford and Richard M. Nixon. This is the U.S. Mint’s last set with circulating $1 coins wholly dedicated to United States presidents. Today, July 5, the U.S. Mint introduced its last Presidential $1 Coin & First Spouse Medal Set. 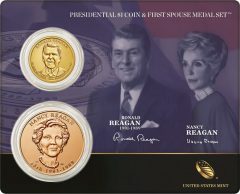 This newest product honors Ronald Reagan, the 40th President of the United States, and former First Lady Nancy Reagan. 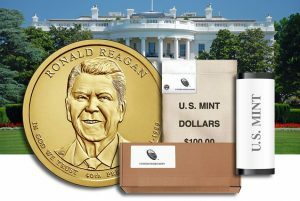 A United States Mint 10-year program comes to a close with the 2016 Ronald Reagan Presidential $1 Coin. 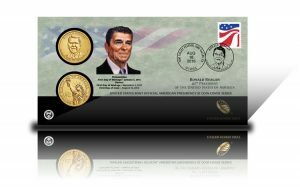 Today at noon ET, circulating-quality Reagan dollars became available in rolls, bags and boxes. 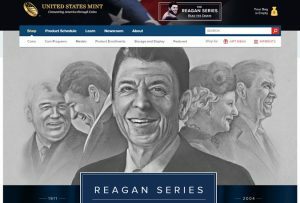 The U.S. Mint this week unveiled Part I of a four-part series chronically the life, legacy and influence of Ronald Reagan, the 40th President of the United States . 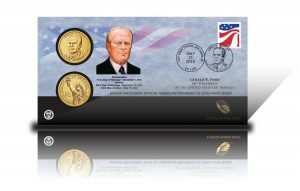 Today, May 17, the United States Mint released its latest coin cover that includes two circulating-quality dollars featuring Gerald R. Ford. 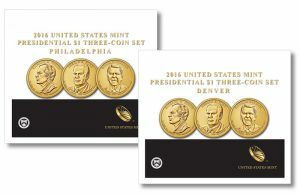 Today, April 8, the U.S. Mint started selling the second to last Presidential $1 Coin & First Spouse Medal Set. 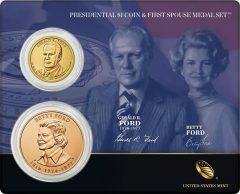 This newest product for collectors memorializes Gerald R. Ford, the 38th President of the United States, and First Lady Betty Ford.